Dana and I have been mostly home bodies thus far. Aside from accompany Nicole to a birthday party just shy of five weeks old, our outings have been mostly doctor related. I have been itching to get out of the house, and today felt like a good enough day to do just that. Today Dana accompanied me for some Easter shopping. We needed new baskets, and things to go in the baskets! The past couple years I’ve been getting the girls flip flops and jelly shoes. (I strive to fill the kids’ baskets with mostly useful things for the changing season.) The girls get excited for the shoes, but wear the flip flops for a day, and the jellies slightly longer. They just don’t find them comfortable. Instead they use their crocs for water play and hanging out near the pool. This year the Easter Bunny decided one special pair of crocs was better than two pairs of unused shoes. They take up roughly the same amount of space in the Easter basket too. I’ve been feeling a bit guilty lately about being a mess-phobe. Back when Nicole was a toddler her preschool teacher remarked about how wonderful it was that I didn’t mind her drawing on me with chalk. So I was hoping to find something art related to put in her Easter basket. Nicole got a set of bath time finger paints for her birthday that she loved, which seemed like the perfect balance between creative freedom and controlled mess. I was about to purchase a set of six off Amazon for $20 when I decided to check target first. I’m so glad I did! They were $1 a piece! I got the full set – twice the number of colors – for each Nicole and Alexis for 60% of what I would have paid. In years past I’ve also included sunglasses and stuffed animals, but we’re inundated with that stuff. Instead I was looking for something that can be used outside and settled on punch balloons shaped like animals. We finished it off with a chocolate bunny (for my chocolate lover), and a marshmallow bunny (for my marshmallow lover). Of course it’s one of each for each child, even though the chocolate lover will like the concept of the marshmallow bunny lollipop in concept way more than in implementation. Don’t worry, the bunny can take up the cause of finishing it after she rejects it. 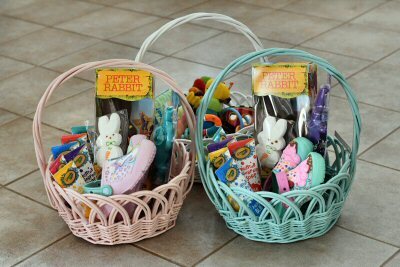 I think these baskets will be the biggest hit yet. The bunny done good, and felt great getting out of the house!